I experiment a systematic clogging (or at least under-extrusion) with PETG, early from the raft level… and on part itself if I tinker to pass the raft. => Is anybody can advise a functional configuration ? 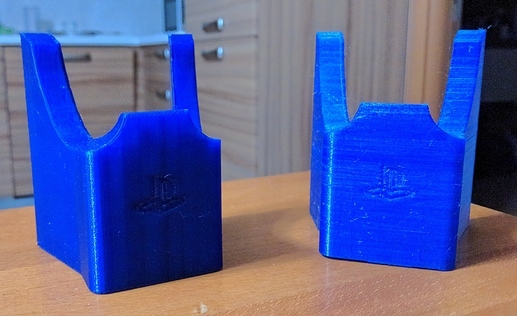 some time ago I had the same problem as you, I recently installed the micro swiss kit and made a couple of prints with PETG that ended correctly. How many hours of printing do you have? Do you use the original hotend? What brand is the filament you use? My hotend is 6 months old, but it is a “full metal jacket”, with no PTFE inside. I just ordered the PTFE version, to test it. I test further brands (the Mouser one, the Farnell one, ArianePlast who is a french High quality plastic manufacturer). Exactly the same clogging result. Can I ask you your parameters ? by the way, could you provide me a link to this “micro swiss kit” ? I have a coil of Zotrax PETG and, for now, I have tried only with this coil, but I also want to try with the others from eSun. The parameters at the moment are those you find in ZSuite. As soon as I try with the others I’ll let you know. those for the Z-PETG ? Thx for the link, I’ll check that. Yes for PETG, but I use the Zortrax material. With another brand I have not yet tried. last weekend I’ve tried several prints with eSun PETG filament and I’m very satisfied. In the attachment you’ll see on the left models printed with micro swiss hotend, on the right the one with original hotend. I’ve tried another spool of white PETG, 3DJake brand, apart some small issue with configuration (temperature and first layer gap) I haven’t got any extruding problem. I wouldn’t have bet on a such big difference !!! About my original issue, I try again with my filament + Z-PETG parameters at my favorite Fablab, and printing has run : I assume a too much moisture environment in the room where my M200 is located. => At all : Be careful to the moisture, especially with special filaments like PETG.